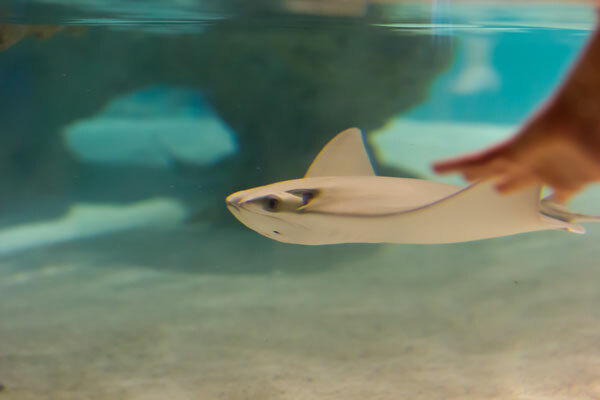 How do I get to the Shark and Ray Touch Tank? The touch tank, two additional viewing tanks and the jellies exhibit are in the Aquarium’s West Wing. Reach the West Wing from the lobby, directly next to the restrooms and lockers. What is the best time to be there? If you are planning to visit during school vacation time, be prepared for the touch tank area to be busy. First thing in the morning (the exhibit opens at 9:30 most days) is the best time to be there. If you can’t do that, the end of our day (check the website for closing times) tends to be quieter. Stingrays? Won’t they sting me? Nope! Our rays have all had their stinging barbs clipped, just like you might clip the nails on a cat or a dog. The barbs grow back, and are clipped again before they have a chance to get big enough to be a problem. 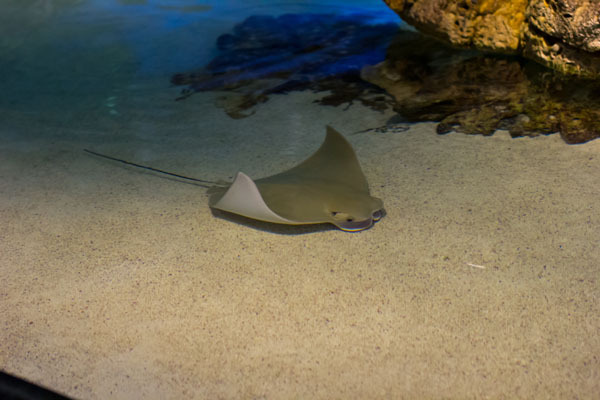 Also, rays generally only sting if they feel that their lives are in danger. Sharks! Won’t they bite me? Even though sharks have a bad reputation, they are not into biting people. Our sharks, like most sharks, are small, shy animals. In fact, you may not even see them when you first get to the exhibit. They like to hide. What’s the best way to touch them? Roll up your sleeves. Make a flat hand, like you’re giving a high-five. Place that flat hand into the water, with the water somewhere between your wrist and your elbow. Be still and quiet – rays and sharks can hear you, and can feel your movement, and they will get scared away if you are too loud or move too much. When they come near, you may gently reach down and pet them on their backs. 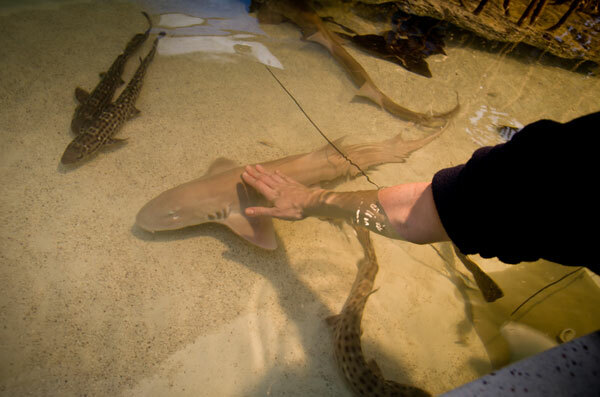 We hope to see you soon at the Trust Family Foundation Shark and Ray Touch Tank!